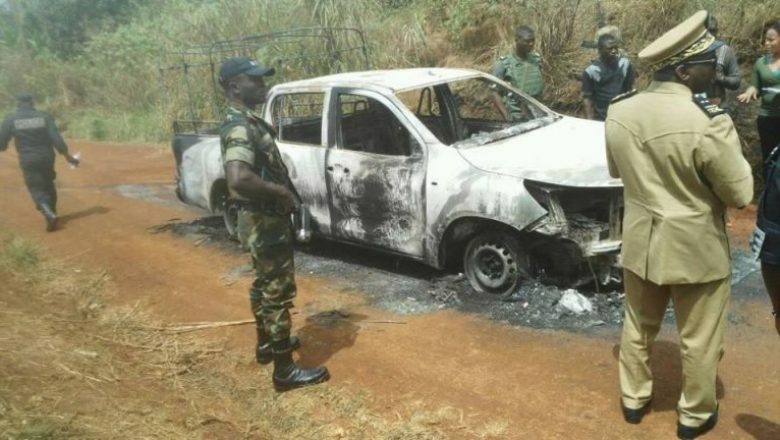 File photo of an administrator, Animbom Aron who was kidnapped in Batibo and his vehicle burnt down. A video has been released of the Regional Delegate of Social Affairs for the North West Region, Animnom Aron who was kidnapped recently in Batibo. In a video which started circulating on social media on Saturday evening, reportedly from the Ambazonia Defence Forces, the Delegate calls could be seen calling on the Minister of Social Affairs to help release the Ambazonia leaders who were arrested. « Iam Animbom Aron Yong, Regional Delegate of Social Affairs for the North West Region. I am pleading to the Minister of Social Affairs to intervene that the leaders of Ambazonia that were arrested and we are told that they were brought to Yaounde that they should be shown to the publicly that the people are alive because I am here and they have given me 48 hours that I will be sacrificed if these leaders are not shown to be alive. I have been kidnapped by the ADF and I am pleading to the Minister of Social Affairs to intervene at the level of hierarchy so that my life can be spares, » a video shows the Kidnapped official saying. Animbom Aron was kidnapped on February 25 in Batibo as he was returning from a funeral in the village, just over a week after the Divisional Officer for Batibo Marcel Namata Diteng was equally abducted on February 11 from the Grand Stand. The whereabouts of the D.O of Batibo are still to be know since his kidnap.